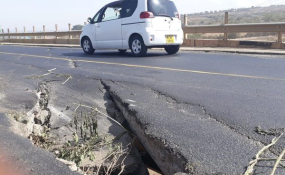 A light earthquake hit several counties in Kenyan on Sunday, including Nairobi, Nyeri, Mombasa, Machakos, Makueni, Tharaka Nithi, Taita Taveta and Kiambu. The earth tremors were experienced on Sunday evening at about 7pm and lasted for several seconds. A nother earthquake tracker, www.emsc-csem.org, reported a magnitude 4 quake in Spain with a depth of 10km that occured about the same time as the one felt in Kenya.